Jacob B. Hinshaw1,2 [Jacob E. Hinshaw12]. He married Mary M. Carter1,2,9,13, Nov 8 18451,2,9,13 [about 184814], Randolph County, Indiana1,2,9,13. Mary M. Carter, daughter of Thomas Carter & Miriam Cartwright2,3,4,7,10,12,15, was born Jan 14 18262,3,4,7,10,12,15 [Jan - 182514], North Carolina2,3,4,7,10,12,15. Mary was the grandaughter of Joseph Carter and Margaret Hinshaw.16 Jacob and Mary were 3rd cousins once removed. Note also that Jacob's brother Absolem married Mary's sister Eliza. Jacob Hinchaw, age 26, born in North Carolina; farmer; $600 real estate. Mary Hinchaw, age 24, born in North Carolina; cannot read or write. Meredith Hinchaw, age 4, born in Indiana. Lucinda Hinchaw, age 3, born in Indiana. Not named, age 2 months, born in Indiana. Miriam Carter, age 16, born in Indiana; attended school. Thomas W. Carter, age 13, born in Indiana; attended school. M.E. Tweed, female, age 11, born in Indiana; attended school. Jacob Hinshaw, age 36, born in North Carolina; farmer; $6000 real estate; $8000 personal property. Mary Hinshaw, age 34, born in North Carolina. Meredith Hinshaw, age 13, born in Indiana; attended school. Lucinda Hinshaw, age 12, born in Indiana; attended school. Zimri Hinshaw, age 10, born in Indiana; attended school. Uriah Hinshaw, age 8, born in Indiana; attended school. Stephen Hinshaw, age 6, born in Indiana. Mary J Hinshaw, age 3, born in Indiana. Hinshaw Jacob B, age 37, born in North Carolina; farmer. Hinshaw, Jacob B., age 46, born in North Carolina; farmer; $8000 real estate; $1500 personal property. Hinshaw, Mary, age 44, born in North Carolina; keeps house. Hinshaw, Zimri, age 20, born in Indiana; works on farm; attended school. Hinshaw, Uriah, age 17, born in Indiana; attended school. Hinshaw, Stephen, age 15, born in Indiana; attended school. 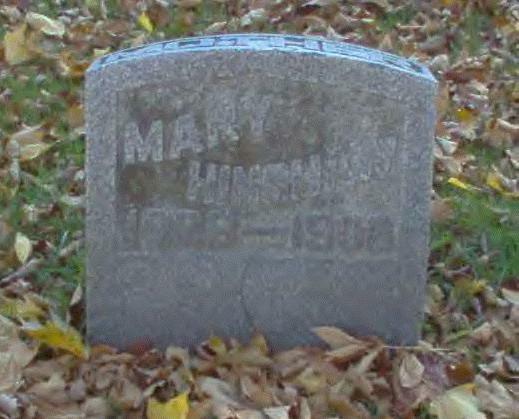 Hinshaw, Mary J., age 12, born in Indiana; attended school. Hinshaw, Jacob E., age 8, born in Indiana; attended school. Hinshaw, William E., age 5, born in Indiana. Hinshaw, Jacob B., age 46, born in Indiana [sic]; parents born in North Carolina; farmer. Hinshaw, Mary, wife, age 54, born in North Carolina; parents born in North Carolina; keeping house. Hinshaw, Nancy, mother, age 79, born in North Carolina; parents born in North Carolina; widow. Hinshaw, Jacob E., son, age 17, born in Indiana; parents born in North Carolina; works on farm; attended school. Hinshaw, William E., son, age 14, born in Indiana; parents born in North Carolina; works on farm; attended school. Carter, Irena S., age 6, born in Indiana; parents born in Indiana; attended school; attended school. Reynard, Emily S., boarder, age 26, born in Indiana; parents born in Indiana; school teacher; attended school. Hinshaw, Jacob, head-of-household, age 76, born Jan 1824 in North Carolina; parents born in North Carolina; married 52 years; occupation: farmer; owned farm (free). Hinshaw, Mary, wife, age 75, born Jan 1825 in North Carolina; parents born in North Carolina; married 52 years; 9 children, 6 living. Aloroid [unclear], Edmund N., boarder, age 35, born Dec 1864 in New York; parents born in New York; single; [..occupation unclear..]. Muncie, Ind., Aug. 30. -- Mrs. Anna Johnson, of Muncie, a relative of the Hinshaw family, came home from Randolph county yesterday and told of meeting W. E. Hinshaw, the prisoner sent home for a ten days' visit to his parents from Michigan City, where he is serving time for murdering his wife. Mrs. Johnson states that the prisoner's old father and mother are dying in the same bed and that his mother failed to recognize him and the father only partially recognized him. At the first day's meal Hinshaw returned thanks at the dinner table with five brothers and a sister present, and all cried at his touching words. Jacob B. Hinshaw died Oct 4 190112,23 [Sep 4 19012,13], at his home, south of Snow Hill Station, Washington Township, Randolph County, Indiana12,23; buried Oct 6 1901, Mount Zion Church Cemetery, near Winchester, Randolph County, Indiana12,23. Jacob B. Hinshaw, one of the oldest, best known and most highly respected citizens of Washington township, died at his home south of Snow Hill station, last Friday. His remains were interred at Mt. Zion last Sunday, after services by Rev. Henry Lacey. The deceased was one of the oldest citizens and residents of the county, but do not know [sic] his exact age or how long he had lived here. Jacob B. Hinshaw was born on January 7, 1824 in Randolph County, North Carolina. 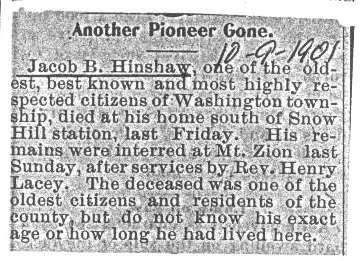 He was a son of Abel and Nancy (Bookout) Hinshaw. In the Fall of 1830, Jacob came with his parents to Clinton County, Ohio. They lived there for three years and six months. About 1834 they came to Randolph County, Indiana, where Jacob lived for the rest of his life. He married Mary M. Carter, a distant relative, on November 8, 1845 in Randolph County. In 1846 they settled on a farm southeast of what later became Snow Hill Station. About 1848 Jacob built a large brick house, which still stands on the farm today. Eventually, he accumulated 280 acres of land and became one of the wealthiest and best known farmers in the county. Jacob's parents were members of the Society of Friends, and in that faith he was raised, though he was never a member. He later joined the Methodist Episcopal Church and was an active member of the Mount Pleasant (Vinegar Hill) Point, one mile east of his home, though later held at Vinegar Hill Schoolhouse. He donated money to the North Indiana Conference Missionary Society in 1871 from the Mount Pleasant Appointment of the Spartanburg Circuit. Later, his membership was at Mount Zion. Jacob's children were extremely successful. Of his six sons, five taught school at some point. Two were ministers of the Gospel. One was county surveyor and a banker. All of them farmed at some point. The greatest tragedy of Jacob's life came in 1895, when his son, William E., a Methodist pastor, was convicted of murdering his wife. Jacob spent the rest of his life trying to prove Will's innocence. A Jacob Hinshaw was clerk of Washington Township in 1854. It is not clear if this was Jacob A. Hinshaw of Lynn or Jacob B. Hinshaw of Snow Hill. One family story tells of Jacob's relationship with his brother, Absalom Hinshaw. Absalom and Jacob were married to sisters and their farms joined. However, Jacob and all of his "posterity" were staunch Republicans, and Absalom and all of his family were staunch Democrats. This did not affect their close relationship. The Republicanism of Jacob's posterity is evident yet today. His son, J. Ellsworth Hinshaw, was elected surveyor of Randolph County in 1888, 1890, 1894, 1896, and 1898 and elected to the Winchester City Council in 1904. A grandson, Dr. Otis W. Hinshaw, was elected coroner of Randolph County in 1928 and 1930. A great-grandson, Samuel M. Hinshaw, was elected clerk of Randolph County in 1948 and 1952, a great great-granddaughter-in-law, Anne S. Hinshaw, was elected clerk of Randolph County in 1996, and a great great great-grandson, Gregory P. Hinshaw, has served as Vice-Chairman of the Republican Central Committee since 2001. Jacob continued to live on the home farm until his death on September 4, 1901. His death notice called him "one of the oldest, best known, and most highly respected citizens of Washington Township". Funeral services were held at Mount Zion M. E. Church, with burial in the Mount Zion Cemetery. 1850 census, Washington Township, Randolph County, Indiana; roll M432-168, page 44B, line #14, dwelling #53, family #55. 1860 census, Washington Township, Randolph County, Indiana; pg 729, line #22, dwelling #260, family #254. 1850 census, Washington Township, Randolph County, Indiana; roll 168, pg 44, household #53. 1870 census, Winchester P.O., Washington Township, Randolph County, Indiana; page 444B, line #10, dwelling #103, family #103. 1870 census, Winchester P.O., Washington Township, Randolph County, Indiana; page 444A, line #27, dwelling #98, family #98. 1880 census, Washington Township, Randolph County, Indiana; roll T9-0307, ED 173, page 268C, line #21, dwelling #81, family #81. Posting Nov 9 2004 by Andrea Long () to INRANDOL-L, citing: Randolph County, Indiana marriage indexes. 1900 census, Lynn, Washington Township, Randolph County, Indiana; roll T623-399, ED 129, page 10B, line #71, dwelling #241, family #241. 1850 census, Washington Township, Randolph County, Indiana; roll M432-168, page 44B, line #11, dwelling #52, family #54. 1850 census, Washington Township, Randolph County, Indiana; roll M432-168, page 44B, line #6, dwelling #51, family #53. 1860 census, Washington Township, Randolph County, Indiana; pg 729, line #8, dwelling #257, family #251. "Fort Wayne Sentinel", Aug 30 1901; http://www.ancestry.com. "Fort Wayne Sentinel", Sep 4 1901; http://www.ancestry.com.